I may be wrong, but I believe that the HD1000 and HD3000 are the last of seven new machines that Janome will be introducing in December 2010. If you’ve been reading the recent Temecula Valley Sewing Center blog posts, you’ve seen that Janome has really been hard at work. The truth is, Janome is always hard at work bringing its customers quality products at affordable prices. The new HD series machines are both mechanical type (as opposed to computerized) machines. I for one prefer computerized sewing machines, but I have quite a few customers that are old fashioned, and just don’t trust computers. I always try to suggest that computerized machines are very well made, and that they can have confidence in their reliability, but sometimes I just can’t win. The good news is, for anyone who still prefers mechanical type sewing machines, Janome has a pretty good selection. As you can see, there’s plenty to choose from when it comes to mechinical type Janome machines. As for the new HD series machines, the HD1000 seems to be an upgraded TB-12. I think the graphics on the machine and a new built-in needle threader are the only things seperating these twins. Then there’s the HD3000, and I really don’t know what to say, other than I would stand on my head to try to get you to buy a Magnolia 7330 instead. I’m not trying to bash the HD3000, but if you want my opinion, then there it is. What do you think? Wow, I'm impressed. It's not every day that you see a dealer steering you towards a less expensive machine. Thank you. I was just wondering which Janome would be best, the HD1000, HD3000, or the Magnolia's 7318 - 7330. I'm a beginner but want to sew a lot of layers, and thought the term "heavy duty" would mean stronger power, but I see you recommend Janome's Magnolia 7330. I've never use a computerized sewing machine. Would you recommend I try them? Can you give your first, second, third & fourth choices, thinking about long term performance, and also for price. Thanks for your input! Marcelle, I do recommend computerized sewing machines over mechanical type machines. Most of them sew smoother, are quieter, have more functionality, and are easier to use. You wanted me to give you a top 4 list to select from, but you didn't give me a price range, which makes a difference. For instance, if your budget is tight, the Magnolia 7330 would be a great choice. Even as a beginner, I think you should think of how much sewing you will actually do. If you think you will sew a lot, then spending more money on the machine may give you more enjoyment over the years. 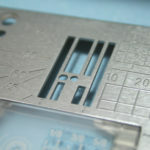 Some of the more expensive, professional type models are more heavy duty as well, which is proportional to their ability to sew through thick materials. I just saw a DC1050 and liked the way it looks better than the 8077, but can you tell me more about it's performance? Thanx! Marcelle, I really like the Magnolia 7330 best, but I'm confused about what you said in your previous comment. You said you had up to $4,300 to spend, so why settle with machines that are 10% of that in price? If you want something you can grow with, they your best option would be to get something like a MC6300P, MC6500P, MC6600P, or the top of the line Janome Horizon! With your budget, you could get a Horizon and still have a lot of extra money. Now, we don't sell outside the US, and some machines are not available unless you come into the store to make your purchase. 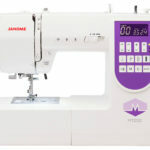 As far as I know, the Janome machines we sell are not about to handle 220V electrical connections like that of MX or European countries. You are probably going to either buy a transformer or buy the machine in MX. 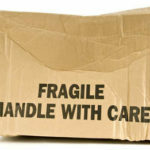 The electronic types machines don't have problems more or less than mechanical types, but you may hurt the machine if you plug it in to the wrong electrical connection, and that is not covered under warranty. I was thinking my sister could go buy it, and then ship it to me. I will check the models you've recommended. I have read a lot and am confused, and some say there's no big difference between cheaper or more expensive machines in regard to their performance. I want to make a lot of stuff so I need it to be a Heavy Duty, aluminum or cast iron machine. Sorry! I have all these doubts. Thank you for the reply. Sorry about the pricing. I was thinking in Mexican pesos. My budget is 300-420 USD. I really like the Magnolia 7330. That would be my choice if I had your budget. Actually b.gottier, there are Janome machines that are sold here in the USA that are "dual voltage". For instance all of the Memory Craft line is indeed dual voltage, and able to run on both 220/240 and 110/120 50/60 HRZ, I have the Janome MC9500, that was purchased here in the states, permanetly set up at my summer home in Italy, and my Horizon that i have taken over there and it too is dual voltage. Now as far as mechanical machines go, all mechanical machines are able to be used with a step up step down transformer, as there is no computer components that require speecific voltages and hertz. So to answer your question Marcelle, yes you can use a Jamome Memory Craft machine in Mexico, or a Mechanical and use a transformer.. I suppose there must be an internal switch on some models? Or is it external? No switch, just plug in and sew? Hi Ashley! 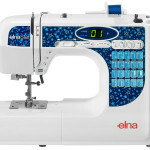 I have been searching high and low for good quality dual voltage sewing machines, and your post has provided the most information so far! Do you by chance know all the Janome models that are dual voltage? I am stationed in Italy with my wife and want to buy her on that can be used here and in the states, unfortunately I can't budget enough for a memory craft, but maybe there are others? Thanks for your time! Well B, :-) some models it is internal and automatic, and on others it is external. Depending on which model you have. It should also be listed in the manual and the instructional DVD if so equipped. My school has decided to offer a fashion design program and has asked me to recommend machines for the sewing lab. Someone suggested the Janome HD1000 and another suggested the Bernina 1008. 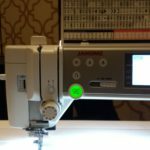 I personally love my Bernina Virtuosa 160 Plus and am probably biased toward Bernina and also computerized machines, but I want something that will stand up to student abuse. Kate, The Bernina 1008 is great for classrooms, but I'm not thrilled with the A/C motor, because it limits the slow speed control of the machine. If you decide to go with Janome, I'd think the HD3000 would be a better fit in a classroom environment, especially if the students are K through 12. 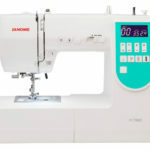 With the Janome HD3000, the bobbin case isn't something that comes out when changing the bobbin, and lost Bernina bobbin cases can cost your school a lot of money over time. One of the benefits to the Bernina is that you can purchase the optional finger gaurds, which can help you avoid legal issues as one of your students could end up in ER with a needle stuck in their finger bone. There are a lot of things to think about. The Bernina computerized machines are great, but even with a school discount they can be very expensive. It would be helpful to know your budget, and how many machines you are going to need, to advise on the best machine(s). We are a community college and are thinking of purchasing about 20 machines (max in class is set for 18 but I think 14 is more likely). There will be Technical Skills for Apparel I and Tech Skills II classes using the same lab. The more advanced students need to be versed in computerized machines. I was thinking that at least 5, if not more, should be computerized, and that we will need sergers (but I don't know how many or what to ask for). Ask for the moon, all they can say is no. I just purchased an HD3000 from an estate sale, and I think the feed dogs are stuck. I've tried to move the lever to drop the feed dogs, and it wont move. When I try to sew, the fabric stays in one place and wont move. Any suggestions on what to do? JaneAnn, It could be something as simple as lint packed under the needle plate. Take off the needle plate and see if there is lint under there, and if so clean it out. Make sure you stitch length is something other than zero. If you still have problems you'll need to bring the machine in for service. I am undecided between the Janome HD3000 & Magnolia 7330. I'm older and like mechanical, but quieter is very appealing. I need to be able to sew on heavy fabrics - 4 layers of denim. Will the Magnolia hold up and perform? Suzanne, I really prefer the 7330. It does very well sewing denim, and one of the demonstrations we do for customers involves sewing over thick denim seams. I really don't believe you are getting a more heavy-duty machine by buying the HD3000. If you live near us, come in for a demo. We'd be glad to show you both machines. I have not bought a sewing machine since the 80's. The 1987 Singer sewing machine I have is very limited in what it can do and it is acting up making it hard to complete projects. It's limitations limits my creativity and not being able to get through a project without something going wrong is taking the joy out of sewing. I went to a dealer who sells both Brother and Janome. The dealer at this shop and everyone else I talk to says not to buy a Singer or any machine by way of the Internet, Target, or Walmart because they are poor quality machines. They are made with a lot of plastic parts that will break. I know I want a computerized machine because I would like to have the creative flexibility with all the utility, decorative, and buttonhole stitches. I want to sew different types of fabrics from sheer to leather. It would be nice if it came with an assortment of feet. I would like to make pirate costumes and accessories, pocket books / bags, pillows, curtains, clothing, and do a little quilting. I would like the machine to be quiet and not vibrate around while I am sewing. I would also like the machine to last me 5 to 10 years, longer if possible. My budget is 800 dollars or less. I am not stuck on a particular name brand. I also do not believe paying a huge amount of money is going to guarantee the machine will be a great machine and last a long time. I am lost in a sea of choices and need someone's assistance in choosing a machine that will give me what I am looking for. Considering your budget, I'd recommend the Janome DC5100. I won't overwhelm you with info, but if $800 was my budget, that's the machine I would buy. Hi. I sew martingale dog collars as a side business. I generally am sewing through about 8 layers of fabric and 8 layers of interfacing (pellen 808) at a time. I currently have a husquvarna Viking emerald 118. I had never sewn before about three years ago. I am looking to buy a janome and keep my Viking as a back up. We suspect the foot pedal is going bad as it will sew on its own after a long bout of sewing. I am between the hd3000 and the magnolia 7330 for my main sewing machine. What is your opinion. Or other suggestions. If it were me I'd make sure to go to a dealer where I could sew on the machine before making my decision. If all you need is a straight stitch, you might consider Janome's 1600P line of machines. These are very heavy duty, and would allow you to sew much faster than the models you were interested in. Time is money. Hi! I'm an intermediate sewer who has always worked on a mechanical machine. I used to be very familiar with my mother's old Brother sewing machine and some of the older metal-body Singers of yesteryear, but I'm intrigued by the computerized models. I have a budget of $400, and am interested in a machine that will be easy to use, heavy duty and reliable. 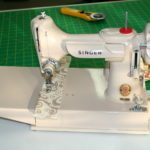 I plan on using the machine to sew home decor items like curtains, pillows, etc. using thick upholstery fabrics, cording, and the likes. I want a machine that is powerful and can easily sew even through leather possible. I'm between the HD1000, HD3000 DC2012 and Magnolia 7330. Any specific recommendations? Of those four machines, I like the DC2012 the best, but this model is no longer in production. The equivalent machine is the DC2014. These machines offer more than the 7330, and the HD1000 and HD3000 are mechanical machines. I don't think you'll be disappointed if you choose the DC2014. Hi and thank you for this very interesting blog. I am in the market for a new machine. I have done a lot of research and am 'almost' decided on a Janome Magnolia 7330. However, I make a lot of bags (several layers of canvas or heavy fabric) and have been looking at the HD3000. You seem to be in favor of the 7330 and I am too (I like the many little 'comfort' features) but I noticed that the HD3000 has an extra high pressure foot for thicker fabrics. The 7330 does not have that and it seems very important to me. Am I wrong? I plan to go in and try both machines but I want your opinion. Thank you. Hi Marguerite. I just went out and looked at both machines. In terms of presser foot height, they both are identical. So, buy the 7330! Thank you so much. You are a lot of help! I am looking for a wedding gift for my daughter. I can see you are partial to the Magnolia 7330. Looks like a nice machine. My daughter will be dividing her time between the US and India. Is the 7330 a true dual voltage/frequency machine? If not, could you recommend a similar quality machine that would meet her needs? Unless specified by the manufacturer, I cannot recommend any make or model sewing machine as being dual voltage. Our 7330 here on the sales floor is marked 120V, so I would assume that it is not dual voltage. Thank you so much for all of your advice and information about these models. I, like many readers, am also struggling to decide between the Magnolia 7330 and the HD3000, but the key features that I'm looking for are the 7-point feed dogs and adjustable presser foot pressure. I work with both thin slippery fabrics as well as heavier fabrics. The Magnolia 7330 has the 7-point feed dogs, but not the adjustable presser foot pressure. I know it has a lot more other stitch features and is computerized, but I don't need stitch variations as much as I need a really good feed system for diverse fabrics. What do you think? Thanks again! Hi, I came across your page while doing my research on the Janome machines. Just out of curiousity, why do you recommend computerized vs. mechanical? Also, looking at the prices, Magnolia 7330 and HD3000 are going at the same cost. I'm a beginner and am interested in getting a Janome machine. For now, I'll be doing simple DIY type of sewing. I need a machine that can handle simple everyday stitching like hemming jeans, stitching buttons, zipper etc. to maybe something fancy if need be. I need something simple to use and for home projects/crafts. What do you recommend? Thanks. I like computerized versus mechanical because I think the computerized machines are quieter, and smoother running. They have less mechanical parts, because the stitch width and length are controlled by stepping motors instead of gears and cams. Also, computerized machines have some features that mechanical machines don't (like needle up / needle down). Both machines are equally reliable and heavy duty, so I just feel like the computerized machine is better. I'm not a fan of modern Singer sewing machines, but as I've said many times before, a person should sew on a sewing machine before buying it. Please come see us, or go to your local sewing machine dealer and try before you buy. All of your questions will be answered when you have the machine right in front of you. With all the above comments, you still would recommend the 7330 over the HD3000, even if I planned on sewing leather from time to time, along with jean hemming? Stacy, I see no real difference in heavy-dutiness of the 7330 compared to the HD3000. I really believe in customers trying the machines before purchasing. If you'd like to bring some of your leather down to our store and sew on the machines before you buy, please come by anytime during normal business hours. What do you think of the model 7325? The 7325 is a nice machine, but it doesn't matter what I think. I think you need to sit down in front of all of these machines and see which one you like better. Janome has so many machines, that it's hard to give you advice unless I know what kind of sewing you do, how much you can afford, etc. Hello! I just want to thank you for your comments on the Magnolia 7330 versus the HD3000. I too was in between and now am saving for a Janome Magnolia 7330. Thank you again.